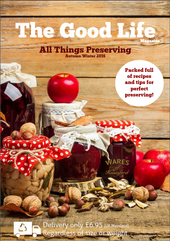 Preserving is a wonderful hobby and for some more than that it is a good living that is growing in popularity all the time. 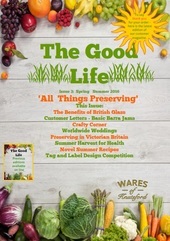 Here at Wares we have launched our own magazine 'The Good Life' in which we present interesting articles on the history of preserving, preserving around the world, recipes, craft ideas, healthy living information, novel uses for jars and bottles and letters from customers with thier memories, tips and ideas. The magazine is sent out free of charge in all our orders and is available as a free download here - along with our free seasonal calender. 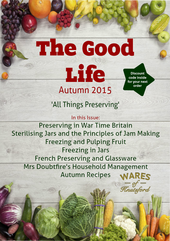 Please do write in with any contribution you would like to make to info@waresofknutsford.co.uk. 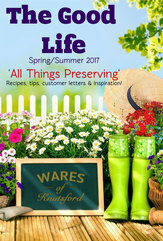 The Wares of Knutsford story goes back to 1992 when Valerie Byles decided the rat race was no longer for her. Having settled in her adopted town of Knutsford and knowing a hardware store had existed on the original premises for many years, the idea of the business was born. When the business moved online preserving became its focal point. The art of preserving had never gone out of fashion and the business has grown off the back of enthusiastic and loyal customers. It’s that same enthusiasm which our guides tap into. 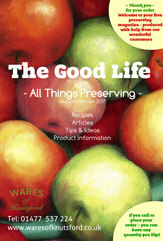 Here you’ll find a selection of guides covering how to use our products and preserving tips and techniques. Guides are added all the time so check back often. New guides are also published on our Facebook page where you’ll find a big community of like-minded people. Click here to visit our facebook page. Our guides are just one of the ways we create a friendly site customers can be a part of. Got questions? Successes or recipes to share? Then our Facebook community is for you where you’ll also find exclusive competitions and special offers. Whether you are new to preserving or not, here we appreciate you want to make your money go as far as possible. That’s one of the reasons we only use flat rate postage and offer the best multi buy deals in the country. But our guides can help too. 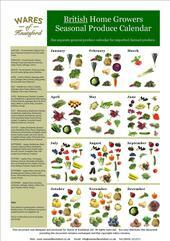 Take our Guide to Seasonal British Produce. Buying in season gets you the best value for money and the best tasting produce. Using the calendar to keep a kitchen diary will help you get the most out of your cooking and preserving. Preserving and cooking with the seasons isn’t a secret, but with so much imported produce, knowing what’s in season when has become more confusing. Don’t just buy British of course, but buy locally where you can. A quick re-cap. 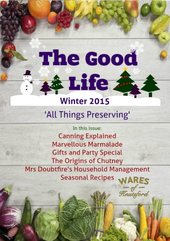 All our guides are free and available for instant download. All you have to do is add a guide to your basket and check out as normal. No postage will be added. You will then be sent an email with a link to the free download. Come join us on Facebook to share your recipes and successes or to just hang out with a coffee.